Monkey Life. : The Howlers monkeys digestive needs.. The drawings you see are a comparison between the stomach of a howler monkey (left) and a human. Food is vital for life. It provides nutrients for development, maintenance, and reproduction, and is the source of energy that drives the chemical reactions occurring in every cell. However, most food, as it is initially procured, is not in a form suitable for use; it must first be broken down so that it can be transported through cell membranes. The processes of breaking down food molecules via a system of both mechanical and chemical, is called digestion. The processes involved in digestion, include, for example, food maceration and enzymatic activity, are common across all vertebrate animals. 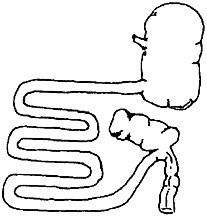 However, other features of a species gastrointestinal anatomy and digestive system are the result of adaptation to chemical, physical, and nutritional properties of the diet. The interaction of anatomy, physiology, and ecology are extraordinarily. Regardless of this complexity, there is an obvious and apparent relationship between digestion and diet, so that one can be little understood without reference to the other. as an associated capacity to consume diets that are high in structural carbohydrates (fiber) and to detoxify plant secondary compounds to various degrees. might entirely avoid other foods. tissue structure of the wall result in the differentiation of the tract into its major recognizable components, including the stomach, small intestine, and large intestine (cecum and colon). of pepsin, trypsin, and chymotrypsin. Many plants defend themselves from animal feeding by arming their leaves and other parts with an array of chemical compounds. Because these compounds are the result of secondary processes involved in defense rather than in the primary metabolism that is important for basic processes such as reproduction and growth, they are collectively known as secondary metabolites.96 To date, approximately 12,000 secondary metabolites involved in plant-animal interactions have been identified. These compounds fall roughly into two broad categories: digestion inhibitors, which interfere with the efficiency with which an animal obtains nutrients and toxins; which are harmful to the animal in that they interfere with normal physiology. deal with toxic secondary metabolites, these being microbial activity and microsomal enzymes. In many herbivorous mammals with specialized stomachs (e.g., Colobinae), some toxic secondary metabolites—although certainly not all—can be broken down via a diverse bacterial and protozoan microflora supported in the anaerobic, alkaline stomach environment. Essentially, plant secondary compounds are degraded during fermentation before they are absorbed by the animal. 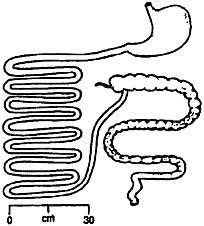 we see gastrointestinal specializations in primates and other mammals, especially in the stomach and large intestine. In primates, as in other plant-eating vertebrates, digestion of structural carbohydrates is carried out by symbiotic microorganisms that live in the digestive tracts of their hosts. In a process known as fermentation, cellulolytic bacteria degrade the structural components of plant cell walls. As a byproduct of this activity, the bacteria release volatile fatty acids, (VFAs) also known as short-chain fatty acids. The host animal uses these acids, among them acetic, propionic, and butyric acid, as readily available energy in the bloodstream or, ultimately, glucose storage in the liver.9,24 Other end products of While some invertebrates are known to contain the cellulose-digesting enzyme cellulase in their intestinal tracts, no vertebrate produces this enzyme. This is an intriguing fact, given that so many vertebrates, including primates, rely heavily on plant material as their main energy source.